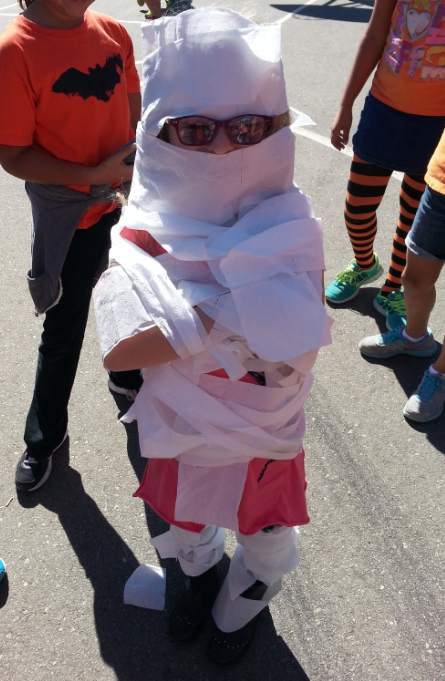 Today was a spook-tacular day! First, the student council had a Guess the Weight contest! 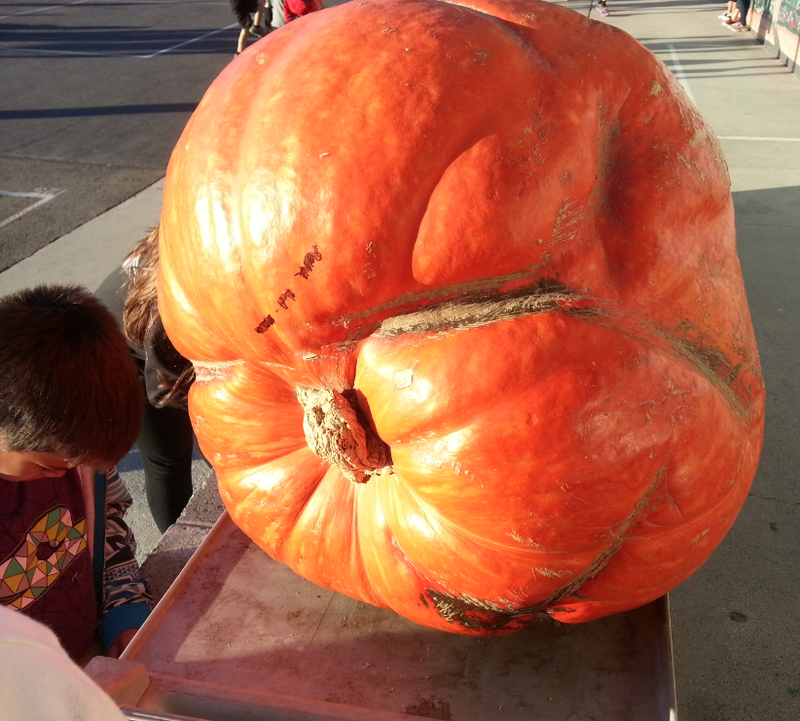 How many pounds does this pumpkin weigh? Write the answer in the comment section! Everyone had fun wrapping up a mummy during lunch! A fun prize for the winning mummy! In the afternoon, we enjoyed some Halloween fun! Look, we search and search for spooky words! 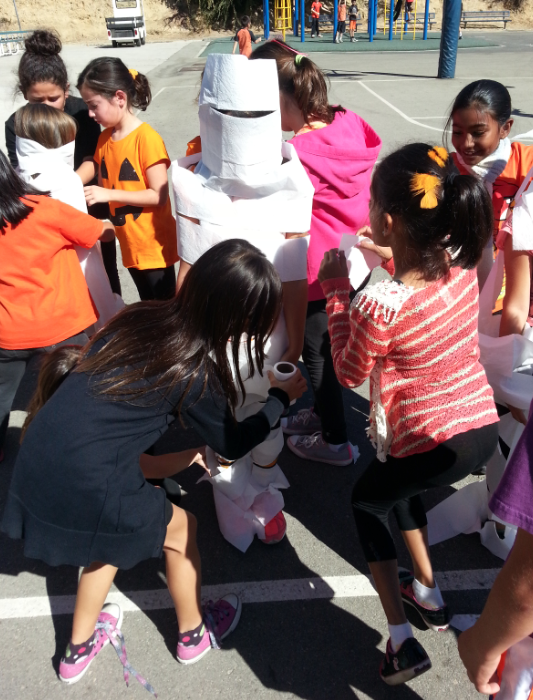 Check out our ghostly art project! 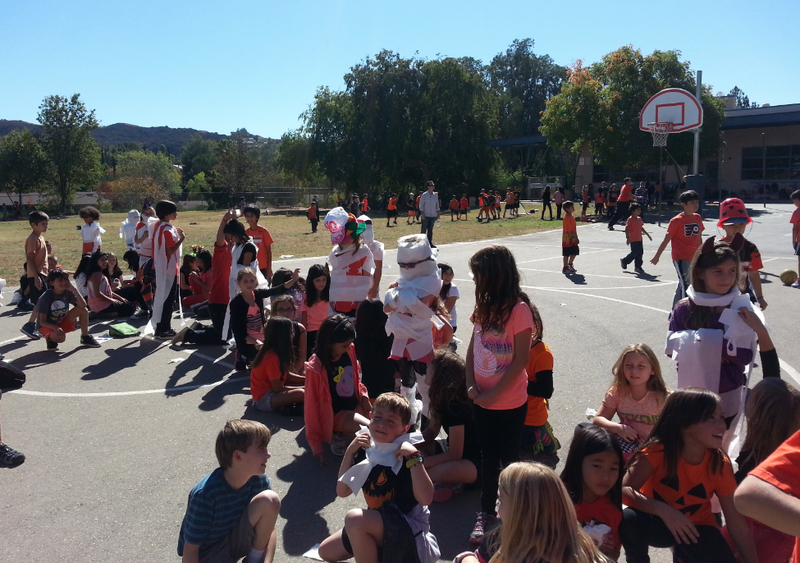 Thanks, room moms, for organizing such a fun afternoon! bring in your box tomorrow! What did you enjoy most about our day? 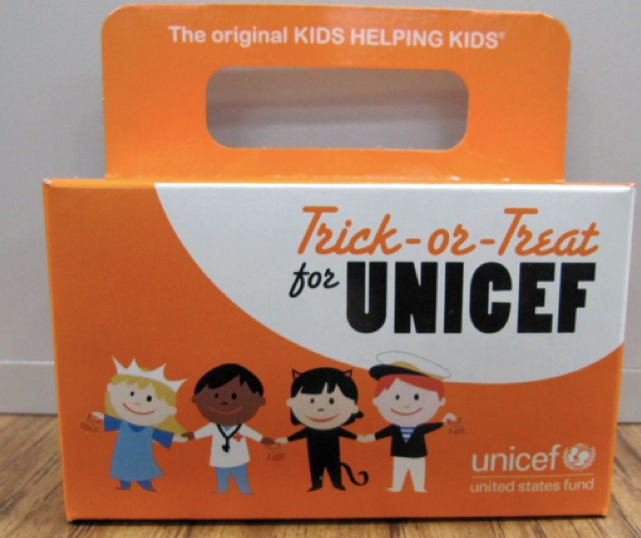 What are you planning to do for Halloween night? What costume will you be wearing? My third graders and I often talk about the joy of personal learning. We defined personal learning as an opportunity to learn because you are personally interested in a subject. My third graders told me that they sometimes learn independently by watching a video or reading directions. 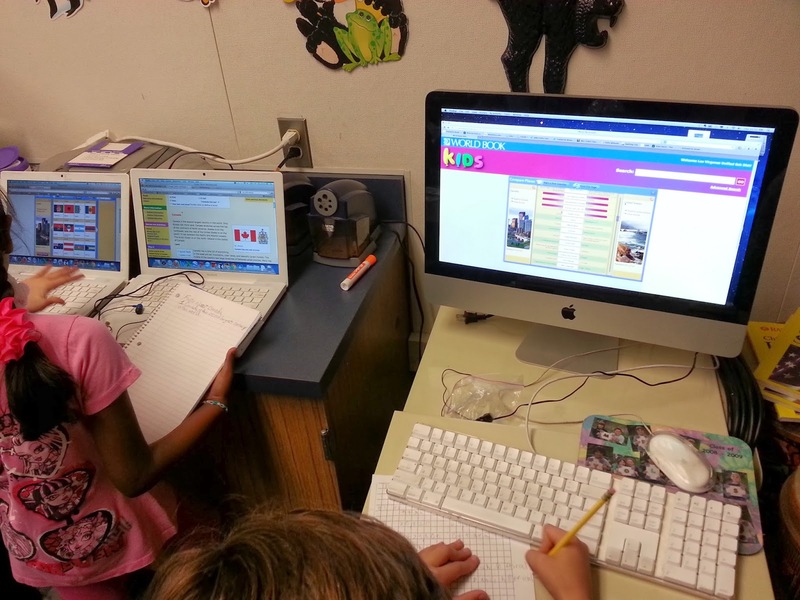 Many third graders said that they learn on their own through trial and error. Today I participated in some personal learning of my own! 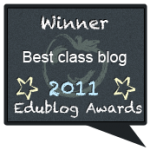 I joined a group of connected educators for something called EdCamp Online. We did not meet in the lobby of a public building. 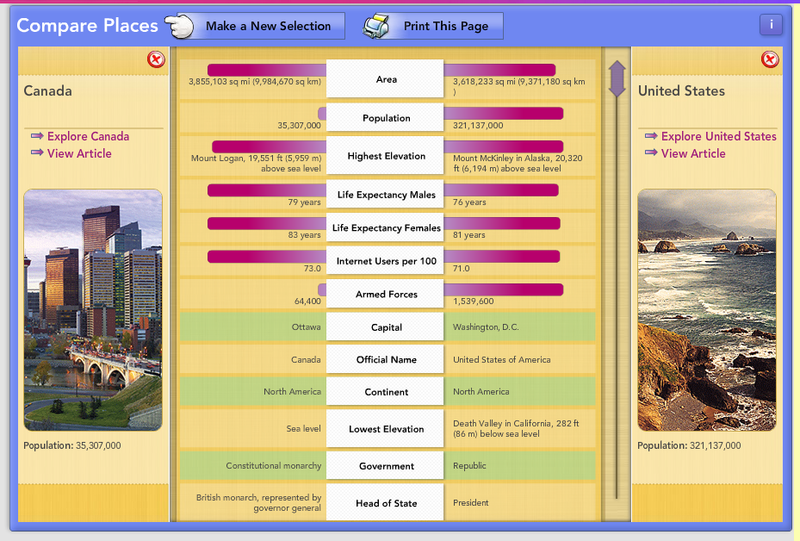 This is a screenshot of the online, or virtual lobby. On the right, are the attendees. (An attendee is a fancy word that means a person who attends a gathering.) The attendees waited in the lobby for the online rooms to open up. On the left is a live Google HangOut. Mr. Theriault, an organizer, is giving the attendees some directions. While listening to the directions, I took a quick screenshot of the attendees. Since the class has been tweeting out photos of arrays, I thought that would be a good photo to get! I could only get part of the array of 100. 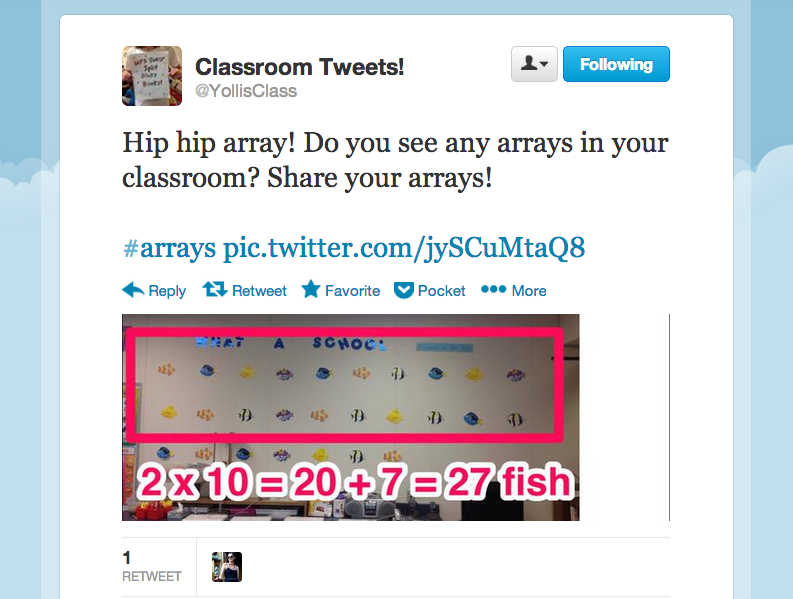 How would you describe this array? Will all the rows have three people? 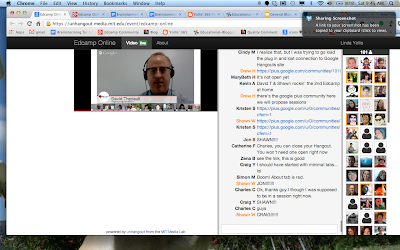 The next step in the EdCamp Online session was to decide what everyone would talk about. Attendees submitted ideas and once enough people +1 (or showed interest) in an idea, the organizers opened up a Google Hangout room. Here is an idea that I suggested to the group. I was interested in talking about Educational Blogging. What information can you gather from this screenshot? At what time was the Google HangOut room created and opened? Next, attendees were given a chance to join a session of their choosing. 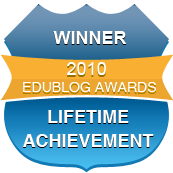 I clicked the "join" button for the Educational Blogging session. Each white box is a space in the online session. How many people could join a session? Here is a screenshot of the Educational Blogging session. There are ten educators in the room. You can see Mrs. Davis, from Texas, is speaking. Mrs. Reed, Mr. Theriault, and I are at the right. At the bottom are the other people in the session. 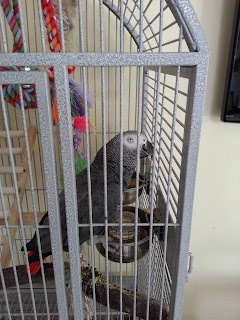 Harvey, my African gray parrot, enjoyed the EdCampOnline so much that he whistled and talked throughout the one hour session! I enjoyed learning with the passionate educators who gave up a Saturday morning to learn together. 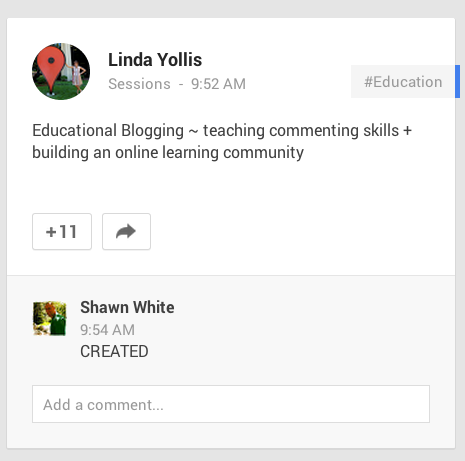 In our session, we talked about helping teachers see the potential in blogging. Rethink old paper-pencil projects and create ways to make the projects more collaborative and interactive. 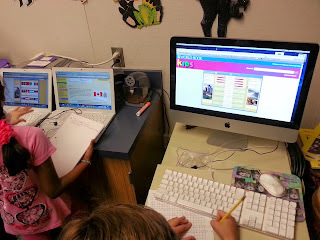 Our hope is that teachers encourage students to find their voice, connect and collaborate with others, and become contributing members of an online community. 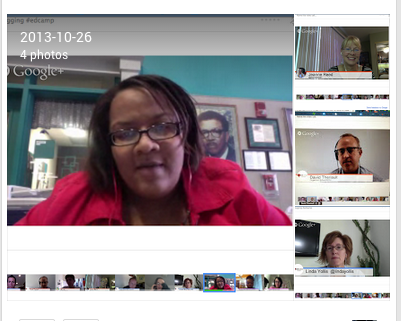 Together, the educators brainstormed some ideas about starting to blog with large numbers of students. Mr. Theriault recommended starting slowly. He allows his high school bloggers to do group blogs at the beginning. 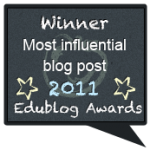 Letting students earn their own blogs is another possibility. 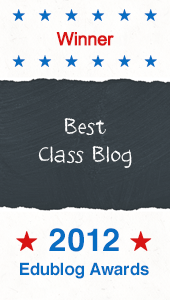 In our class, students who regularly participate on the class blog or 365 blog and demonstrate good work habits can earn their own blog. 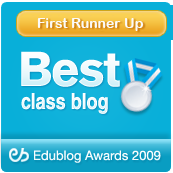 Parents become the administrators of the blog so they can continue the blog after the student moves to the next grade. I shared the success I've had with Virtual Volunteers. Virtual Volunteers are parents who will help support the blog by commenting back to others. The benefits of blogging are tremendous! What do you think of this new kind of online learning? What kind of session would you have suggested? How could we use the EdCamp model in our classroom for Fun Friday? I love to learn alongside my students. A few years ago I started exploring the educational value of Twitter. 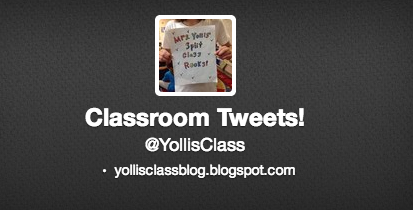 I created a classroom Twitter account (@YollisClass) and started thinking about how we could use it in the classroom. Our first tweet was September 2, 2010! I've used Twitter to define concepts. 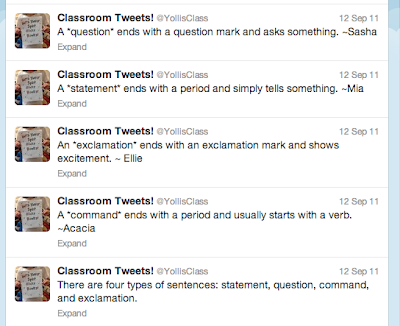 Here students tweeted out the 4 types of sentences. Students enjoyed tweeting these out and had access to the sentence types in the Twitter feed. Students then took turns trying to tweet out example sentences! 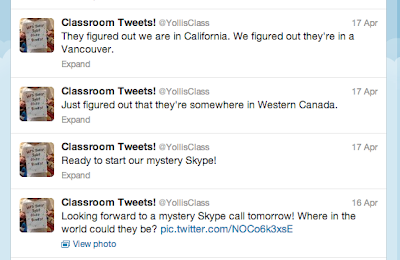 The class used Twitter to chronicle a Mystery Skype call! 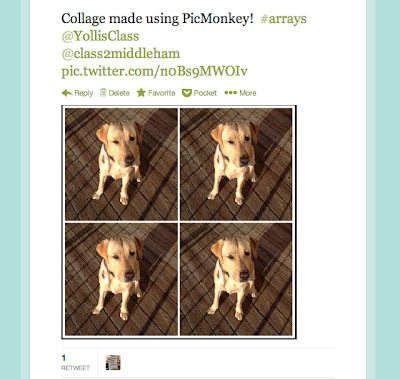 This week, my class has been exchanging tweets with a fabulous class in England, Mrs. Monaghan and her class 2! 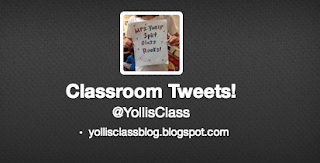 Mrs. Monaghan wrote a post about our Twitter exchange on her Room With a View blog! This British class is experimenting with having a class Twitter account too. 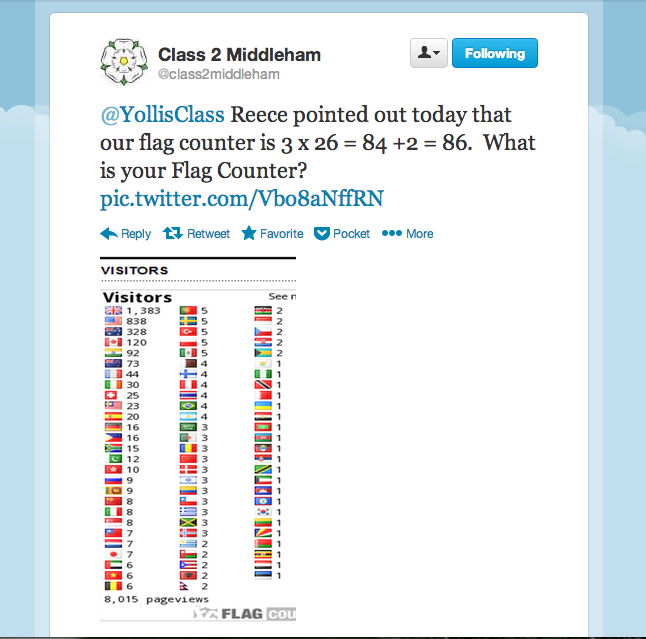 Mrs. Monaghan's class (@class2middleham) tweeted this tweet to us! Like us, they used Skitch to annotate their photo. And then they tweeted this screenshot of an array from their blog sidebar! We looked forward to tweeting back. 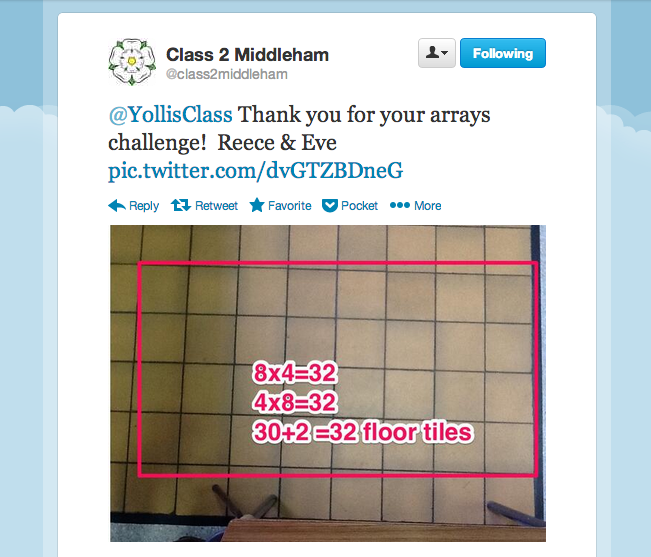 Each time we included their @class2middleham Twitter handle so our English friends would be alerted about our new array. Mia's birthday cupcakes were the most delicious of all the arrays! You can find our Twitter feed in the sidebar of our blog. From there, you can scroll through past tweets. 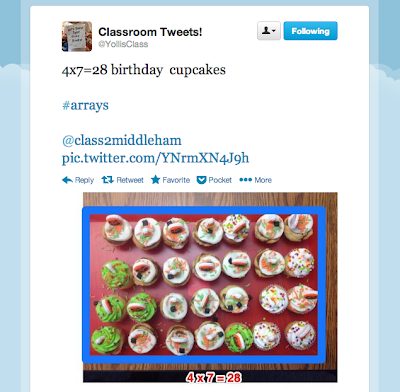 Are you using Twitter in your classroom? If so, join our Hip Hip Array fun! How do you use Twitter with your students? 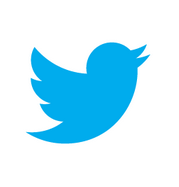 What advice to you have to make our Twitter experience meaningful and efficient? Mrs. Yollis' class read The Talking Cloth, by Rhonda Michell. The main character, Aunt Phoebe, is a "collector of life." Her home is filled with souvenirs from her travels around the world. In class, we started talking about collections. It turns out many people have collections of their own. 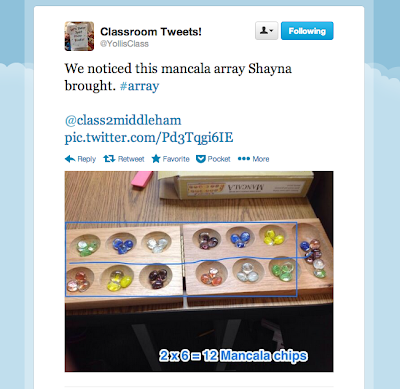 Notice how many people arranged their collection in an array! Like Aunt Phoebe, I like to bring home a souvenir from my travels. Wherever I go, I search for rocks. Not just any rock will be included in my collection, the rock has to be heart-shaped! I discovered my first rock about fifteen years ago. 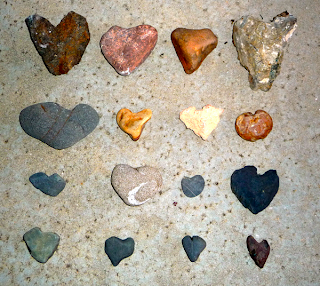 At first I thought it would be difficult to locate heart-shaped rocks, but with a keen eye, it has been easy to do. My favorite rock is one that I got at Zion National Park. When I look at one of the rocks in my collection, it takes me back to the location where I found it and that fills me with happy memories. We have been working on arrays, and I have just the picture to add to the “collection” of blog posts. 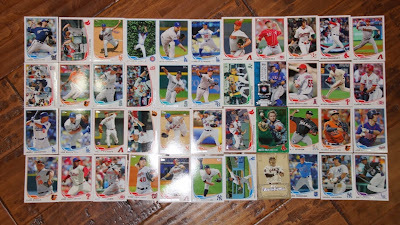 I have lots of baseball cards, but there are three that stand out to me. The first is Manny Machado, third base for the Baltimore Orioles. Another of my favorites is Pablo Sandoval, third base for the San Francisco Giants. Last but not least is Jarrod Saltilamachia, catcher for the Boston Red Sox. Here is a pronunciation key for the name Saltilamachia. It is Sal-ti-la-mak-i-a. 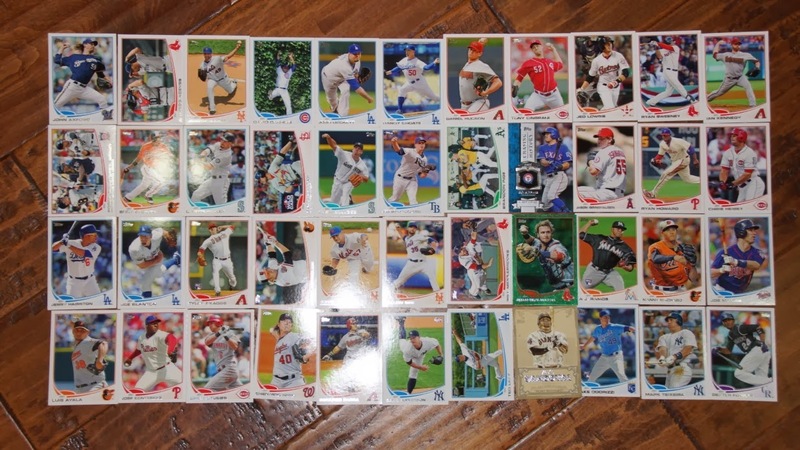 There are four rows of ten baseball cards there. Also known as 4x11 or 11x4. Either way, it still equals 44 cards. I play an imaginary baseball game that just makes time fly when I want it to fly. I play because I love baseball, and I like to make imaginary games. I play by using past experience, scouting on TV, and using my imagination. When I make the line up I try to put Red Sox players in and use the best cards. I play so frequently that I am able to make new line ups, play worst team against best team, and play every time I get a chance because I am so into it. 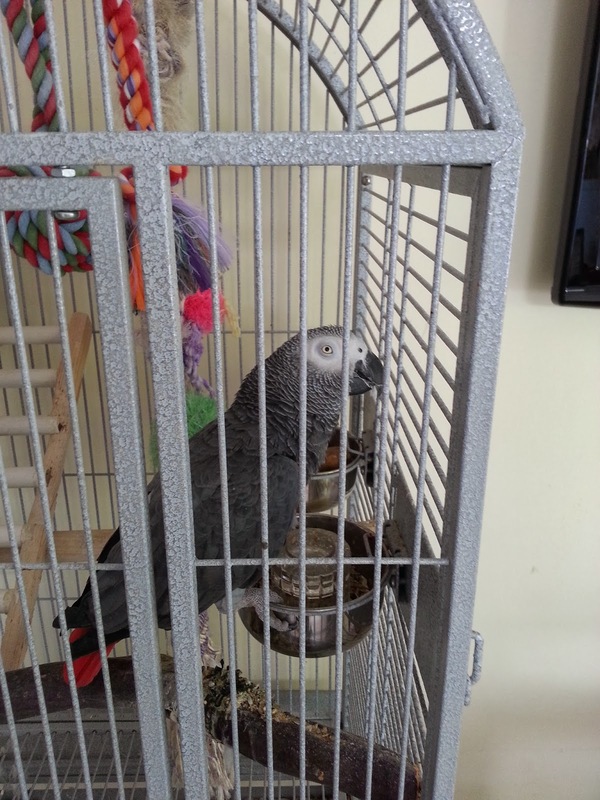 Here is a post that Mrs. Yollis has about her rock collection, Rock Solid Love. 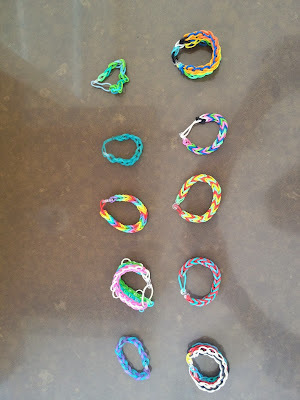 My collection is loom bracelets that I have made in my house. I collect them because they come in different kinds. I started collecting the bracelets after I saw a bunch of people wearing them, and I thought they looked cool. My favorite one is one I don't have but I like it a lot. It is called a starburst. I have ten bracelets, but I can't wait to make more. That is what I love to collect and make. I have a collection of books. I admire this collection because reading is my favorite hobby! Some of the genres that I read are realistic fiction, like the Magic Tree House series, mysteries, like the Cam Jansen mysteries, and random, like Roald Dahl's books. In my opinion, Mary Pope Osborne (author of the "Magic Tree house" books) is an amazing author as her books teach you about history and take you to different places in the world. My other favorite author is David A. Adler because his books take me to Cam Jansen's world, and make me feel like a real detective. The "Roald Dahl" books are the books that I adore the most in my collection. The characters are adventures and love to have fun. My favorite Roald Dahl books are Danny the Champion of the World, Matilda, James and the Giant Peach, The Witches, and Charlie and the Chocolate Factory. I cherish my collection of books, and will always keep reading. I would like to share my collection of Beanie Boos with you! I first started collecting Beanie Boos when I saw my friend Shayna's collection. I decided they were cool and that I should start collecting them too. Thanks Shayna! The Beanie Boos have been given to me by my mom, my grandparents and my friends. They usually buy them at Justice or CVS. My favorite Beanie Boo in my collection is Iceberg because I think he is the cutest. I like the way he lays on his stomach. In the picture you can see Iceberg is the white seal in the center of the bottom row. I think Beanie Boos are great. What's everyone else's opinion? I started collecting Beanie Boos a couple years ago on Easter. The first one I got is Fetch, the one that looks like a Dalmatian. I like them because I like animals, and they are adorable. I especially like their big eyes. I usually get them from Justice or CVS. My favorites are Safari the giraffe and Moonlight the black cat because Safari has the closest birthday to me. Moonlight is also my favorite because her birthday is on Halloween, and that is one of my favorite holidays. Beanie Boos are fantastic! My collection that I treasure very much is my Rainbow Loom bracelets. I started collecting bracelets recently. Some unique colors are glow-in-the-dark and highlighted. There are also all different kinds of regular colors. On the bracelets, there are all sorts of designs. 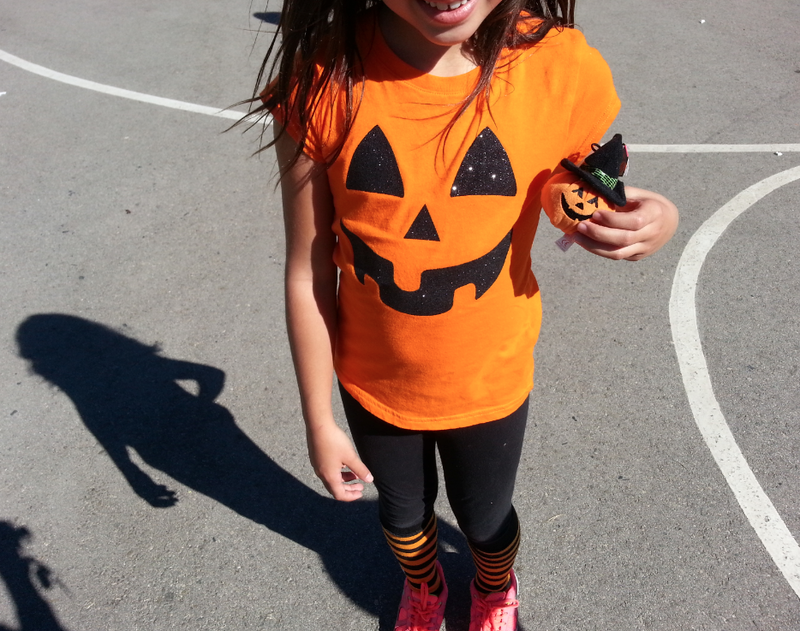 Some designs are the Zippy Chain, Starburst, and the Pumpkin. My favorite design is the Hexafish. The Hexafish is my favorite one because it takes lots of rubber bands, so it is extremely valuable. It is also my favorite because the entire bracelet looks like a swirl. I have many collections, but this one is my personal favorite. 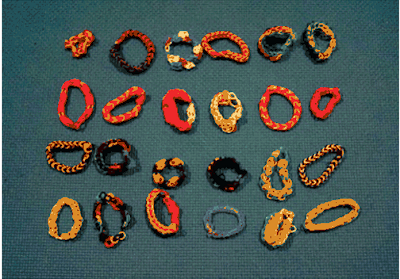 Do you collect these bracelets? This is my spectacular collection of jewelry! I love all of my jewelry the same. The math problem is 4 rows of 6 equals 24, or 4x6 = 24. I don't have a favorite accessory. Each is special in different ways. I started to collect Beanie Boos when I saw that my dentist's gift shop had a display of over 20 stuffed animals. I instantly thought "On my god! Those are the absolutely adorable!" My mom bought me a stuffed giraffe named Safari and that was where it all started. My favorite Beanie Boo is an octopus named Ollie. Ollie is the first one in the third row. I like Ollie because unlike the other stuffed animals, Ollie does not lay on his front or back paws because he doesn't have any. He lays on his bottom just like I do, but I don't have 8 tentacles sticking out when I sit. Do you have a favorite in your collection? If so, what makes it your favorite? I really enjoy getting stickers in my classroom. The way that I earn them is by being exceptional, thinking great, and by doing good things. My favorite stickers are the paw print ones and the ones that say “Nice One!” When I get ten stickers on my sticker card I get “bean bag” time. I love “bean bag” time because it’s comfortable and fun to sit in. These are the reasons I love getting stickers in my classroom! Do you have an incredible collection? We were given a challenge by Mr. Toft and his class in Ottawa, Canada. These Canadians challenged us to pass the ball in an over/under fashion for one minute. The ball could not touch the ground or we had to start all over. After much practice, here is our video! 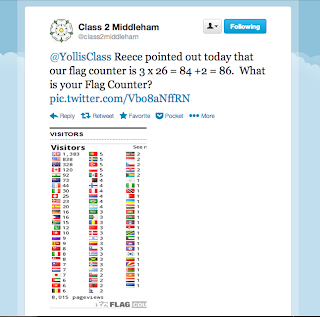 One Minute Challenge from yourwonderfulteacher on Vimeo. The challenge provided us with an opportunity to get to know our neighbors to the north! 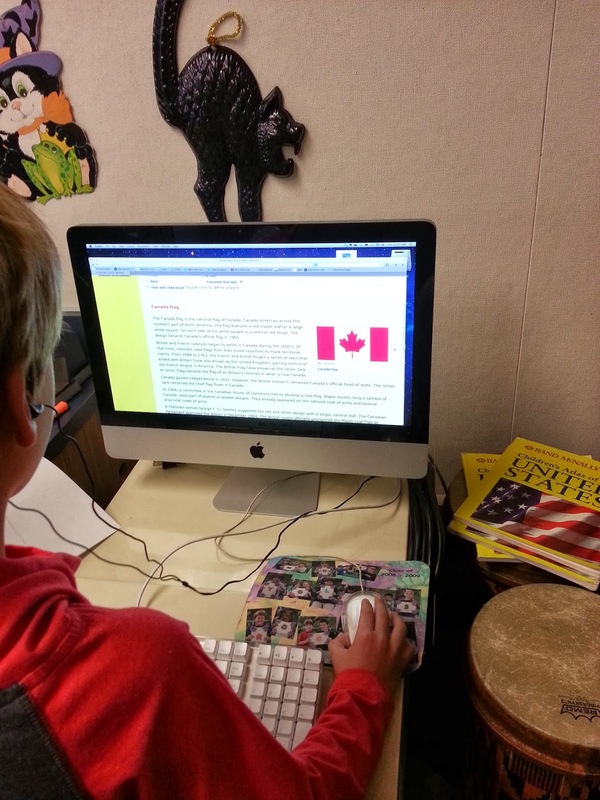 Here are some facts we learned about Canada from our World Book Online Encyclopedia. Some students search using the keyword CANADA. 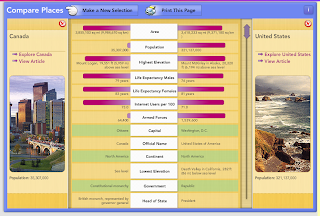 Others use the COMPARE COUNTRIES feature on World Book Online. Canada is the second largest country in the world. Only Russia is larger. There are approximately 35 million Canadians and there are about 321 million Americans. Canada's national capital is Ottawa, where Mr. Toft and his students live. America's national capital is Washington, D.C.
Canada is made up of TEN provinces and THREE territories. America is made up of FIFTY states. What are some fun facts that you discovered about our Canadian friends and their beautiful country? What did you like about the challenge?